Manufacturer of a wide range of products which include transmission shaft. Constituted by a sophisticated and modernized infrastructure facility, we are able to offer a commendable range of Transmission Shaft to our valuable clients. These transmission shafts are available in different sizes and specifications. Our offered transmission shafts are widely used in industries like automobile and engineering for different applications. 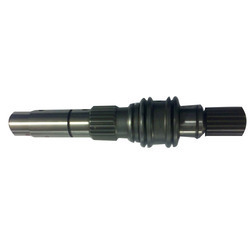 Our range of transmission shafts is available at one of the best suitable price range.